At the present moment, the universe is readily approaching its 14 billionth birthday (current estimates put its age between 13.7 and 13.8 billion years old). In an interesting twist of fate, the laws that govern our universe make it possible for us to peer back at pivotal moments in its evolution, leading all the way back to the first epochs in history. As they say, telescopes are time machines that allow us to study distant, far-off light that left young stars and galaxies billions of years ago. 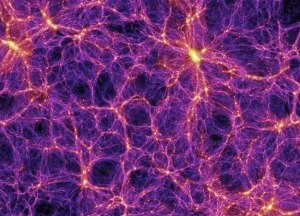 Now, a team of astronomers from the Max Planck Institute for Astronomy has exploited this cosmic loophole to create the first three dimensional map of the cosmic web. Only, this map, which was put together using data from the W.M Keck Observatory, is unlike any ever created before, as it paints a picture of the universe when it was just three billion years old (approximately 11 billion years ago). 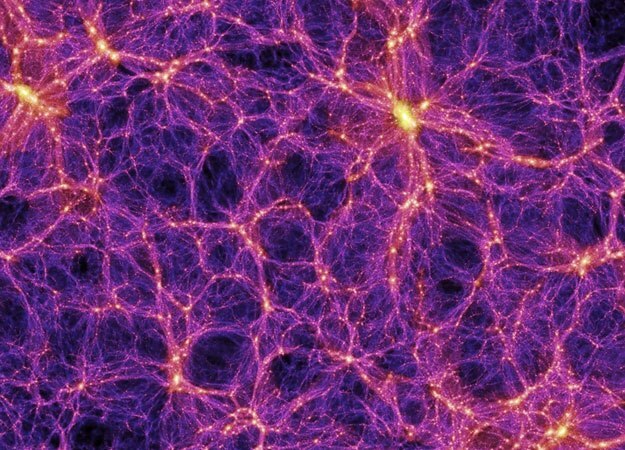 As the name might suggest, this so-called cosmic web is a filamentary structure comprised of galaxy clusters and superclusters held together by the force of gravity. When viewed from afar, these clusters form a huge, web-like network. It’s quite stunning, really; but what’s more is that this huge structure has close ties to the dark matter.. You know, the elusive missing “thing” that makes up a large percentage of the overall mass of the universe. It has long been known that, despite the fact that it can not be seen or directly measured, this same matter plays an integral role in holding galaxies — and by proxy, large-scale structures — together. 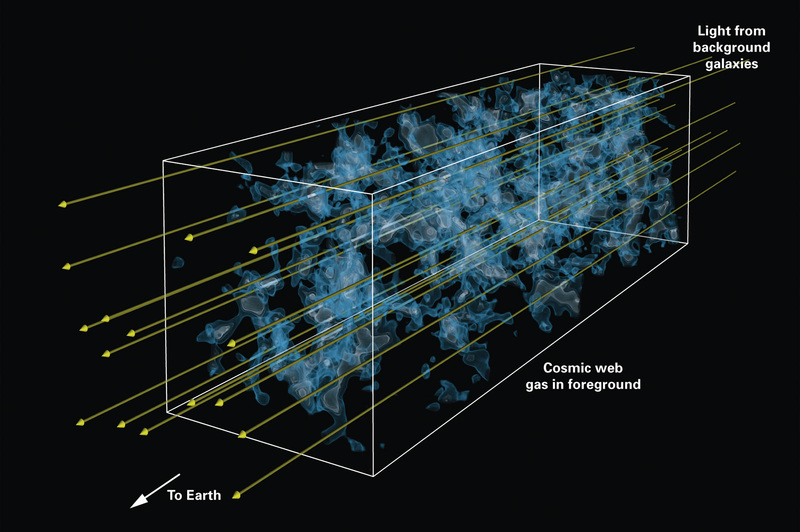 Specifically, dark matter forms the backbone of these structures, with gas loosely filling in the gaps. Also contained therein are the galaxies, including our own galaxy, the Milky Way, but they, by a long shot, only account for a modicum of a filament’s volume, the rest is “empty” (with the exception of the gas — mostly primordial hydrogen — left behind after the big bang). The researchers from the Max Planck Institute for Astronomy have now mapped hydrogen absorption lines within these filaments in a new way. Old methods involved studying dark absorption lines in the spectrum of quasars — an object that is the lovable big brother of a very energetic supermassive black hole. Said lines are left behind after the light from quasars meets intergalactic hydrogen gas clouds and is partially absorbed by them. 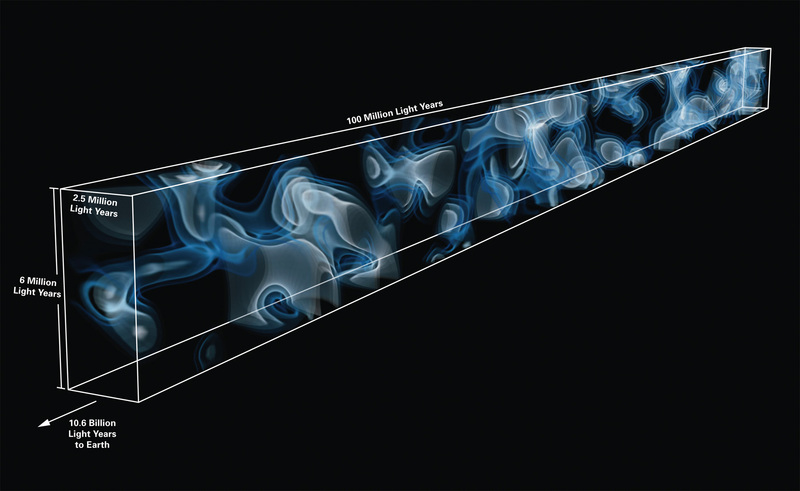 As the light continues on its journey toward Earth, thanks to the expansion of the universe, more and more gas clouds intervene and leave their mark on the light’s spectra, which continues to have its wavelength stretched. The problem, however, is that these objects are extremely distant (ergo, they are very old) and are quite rare. As such, it’s almost impossible to paint an entirely accurate picture of any section of the cosmic web using quasar emission. The new method relies on the faint glow of distant galaxies, which are far more numerous, for the required source of hydrogen absorption lines. Previous estimates said that galaxy emissions are much too faint to capture with clarity using current technology, but the lead researcher believed — and more importantly, demonstrated— otherwise. The research has been published in the Astrophysical Journal. Read it here, or see the full press release here.